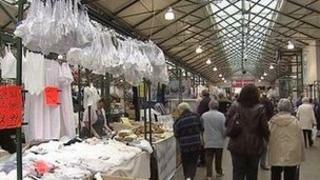 Belfast City Council has turned down a request from St George's market traders to give them two months rent free. They asked for the rent holiday as compensation for trade lost during union flag protests. It would have cost the council just over £65,000. The traders say they are disappointed it has been turned down. It is understood the council feared agreeing to the traders' wish could set a precedent which would encourage further requests from other traders. The council has, however, agreed not to increase fees for stall holders next year. In January, the city council agreed to donate £400,000 towards the "BackinBelfast" campaign to encourage more shoppers into the city centre. Loyalist street demonstrations have been taking place since 3 December, when Belfast City Council voted to limit the number of days the union flag is flown at Belfast City Hall.